This guidance defines responsibilities and establish operational procedures for all drilling operations performed under district supervision, except pavement coring, which is covered in Portland Cement Concrete Base and Pavement - Material Inspection. The district is responsible for the following when drilling operations are to be performed in the district, normally administered through the District Geologist or District Soils and Geology Technologist. (a) Obtaining permission for access to private property except railroads. The latter is handled through the Railroad Liaison Engineer in Multimodal Operations. (b) Locating Utilities and notifying all utilities in compliance with requirements of Chapter 319, RSMo, as revised 2001. (c) Arranging staking or other surveying services if required. (d) Warning the operators when working in a quarantine area. (e) Arranging for settlement of any damage claims. The district is also responsible for the following when drilling operations are performed under technical supervision of district personnel. (a) Requesting necessary drilling equipment from the State Construction and Materials Engineer. (c) Logging and classification of material, selection of samples, etc. (d) Directing the disposal of cores and samples. The State Construction and Materials Engineer is responsible for furnishing the general supervision of equipment, operators, and crews. These responsibilities are discharged through the Geotechnical Section under the general supervision of the Geotechnical Director, the Drilling Superintendent, and the Drilling Supervisor. The Drilling Supervisor is responsible for the field supervision of drilling operations, operators, and crews. While not physically present on each job, if needed, the Drilling Supervisor can be contacted through the Geotechnical Section. The Operator is responsible for the operation and field maintenance of the equipment. No one except the operator or a member of the crew under the supervision of the operator shall operate the equipment. It is the responsibility of the operator to comply with all safety procedures. Certain drilling functions, such as final soundings for structures, special foundation investigation, etc. are performed under technical supervision of the Geotechnical Section or other sections of the Construction and Materials Division. Request for Final Soundings for Structures Form shall be used by the district for requesting drilling services from the Construction and Materials Division. Preliminary arrangements by telephone with the Geotechnical Section are encouraged; however, all preliminary arrangements shall be confirmed in writing, using FAX if desired. Upon receipt of a request, the Drilling Superintendent will assign the required personnel and equipment. The drilling personnel will report to the District Construction and Materials Engineer's Office, unless other arrangements have been made, for instructions as to the location and type of work to be performed. The District Geologist or District Soils and Geology Technologist normally is in charge of the field explorations. 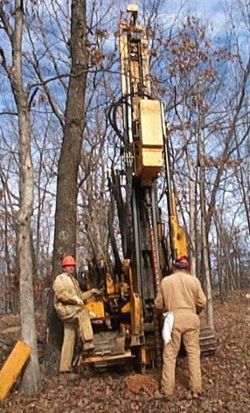 Producer requests for drilling services for material survey exploration purposes will not be approved since commercial drilling services are readily available throughout the state. Requests for drilling for material survey exploration from within the department will be considered and approved on an individual basis. Drilling of buried hazardous wastes requires specialized training, equipment, and decontamination facilities not presently available to the department's drill crews. 1. Suspend drilling and evacuate the area immediately until a determination can be made as to the nature of the material encountered. 2. Promptly seek medical attention for any personnel experiencing ill effects from exposure to suspect materials. 3. Notify supervisory personnel as soon as possible after steps 1 and 2 have been taken. 4. Notify Risk Management as soon as possible. Normally the supervisory personnel will handle this, but it should be clarified in step 3. Drilling may, however, be permitted in areas contaminated with substances which might be environmentally undesirable, but which are not inherently hazardous if handled with care. Examples include certain petroleum products spilled or leaking from storage tanks, brine plumes from salt stockpiles, or leaking municipal or residential sewage lines. If there is any question about the safety of drilling in any such site, approval should first be obtained from the Geotechnical Director, the Drilling Superintendent, or the Drilling Supervisor. In all cases, full disclosure shall be made to all concerned personnel as to the nature of any suspected contaminant and appropriate protective clothing and decontamination procedures shall be used.